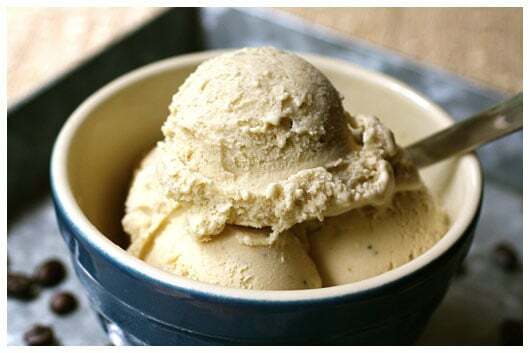 Coffee Ice Cream. Do you love it? Hate it? Seems like there’s not much middle ground on this flavor. And you can probably guess that I’m seated in the “love” section of this arena. Oh yes…right in the very front row! I think I fell in love with coffee flavored desserts even before I started drinking coffee in my late 20’s. The Fryn’ Pan restaurant (Wahpeton, ND) had a Mississippi Mud Pie on their menu that tempted me on every visit. It had a densely packed chocolate cookie crumb crust with a coffee flavored filling, topped off with a thick fudgy drizzle. Ever since that discovery, I have gravitated toward anything with the coffee and chocolate combo. Which makes me wonder why it took me so long to try the “Mud Pie Mojo” at Cold Stone Creamery. How could I have possibly overlooked it all these years? Could it be that I passed it by, thinking there were just too many goodies mixed into that coffee ice cream? Or that I questioned the addition of peanut butter to the usual mud pie mix? What absurd assumptions! It wasn’t until we visited Cold Stone Creamery at the Mall of America a few months ago that I finally decided to give that “Mud Pie Mojo” a go. From the other side of the glass, I watched the Professional Ice Cream Mixologist add Oreos, peanut butter, hot fudge sauce, and chopped pecans to the coffee ice cream. And then he quickly folded it all together on the frozen counter, with a deft wielding of his cold metal paddles. I can still hear the soft clink, clink, clinking of his paddles. It was with only one bite that I knew I was going to have a seriously hard time passing up Cold Stone Creamery from there on out. This special creation was made just. for. me. It turned out that the peanut butter was the most thoughtful addition to mud pie ever. And the Oreos and pecans were just a super duper bonus. I had already been wanting to make the Coffee Ice Cream from The Perfect Scoop by David Lebovitz, so recreating the “Mud Pie Mojo” at home was the perfect time to try it out. And, just like all the other ice cream recipes I’ve made of Mr. Lebovitz’, this was stunning. 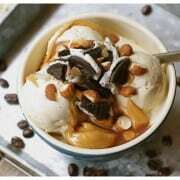 It was perfectly coffee flavored, with a beautiful consistency and creamy texture. 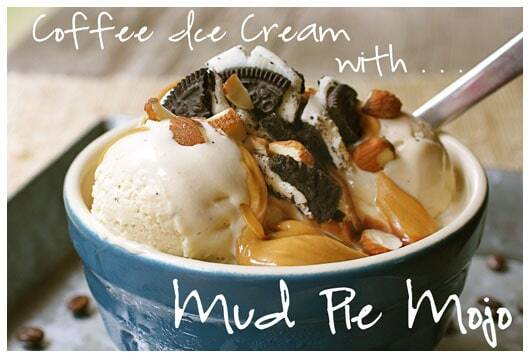 If you like mud pie anything, this here Coffee Ice Cream with Mud Pie Mojo is not to be missed. Make yourself a big ol’ bowl of mojo and then meet me in the very front row! In a medium saucepan, warm the milk, sugar, whole coffee beans, salt, and just 1/2 cup of the cream. Once the mixture is nicely warmed, cover and remove it from the heat. Let the mixture steep at room temperature for 1 hour. Now warm up the coffee-infused milk mixture again. Pour the remaining 1 cup cream into a large bowl and set a mesh strainer on top. In a separate medium bowl, whisk the egg yolks. Then slowly pour the warmed coffee mixture into the egg yolks, whisking constantly. Scrape the warmed egg yolk/coffee mixture back into the saucepan. Chill the mixture thoroughly in the refrigerator, then freeze it in your ice cream machine according to the manufacturer’s instructions. This is the really fun part! And there really is no perfect formula. Simply add as much of the above ingredients as you like. 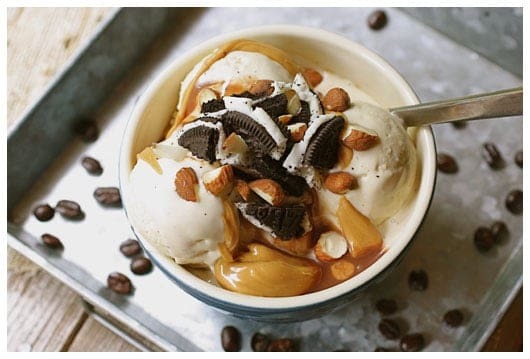 To get the peanut butter’s consistency to “ribbon” over the ice cream, I put a large spoon of peanut butter into a small bowl and stirred it briskly to loosen it up. I made individual sundaes, dressing each bowl of ice cream with these toppings. And I also just stirred a bunch of the remaining toppings into the last of the coffee ice cream, right in the freezer container. This super yummy concoction went straight into the freezer, and I had instant mud pie mojo ice cream waiting for me at my next craving! I’m linking up with the following – please pay them a visit!